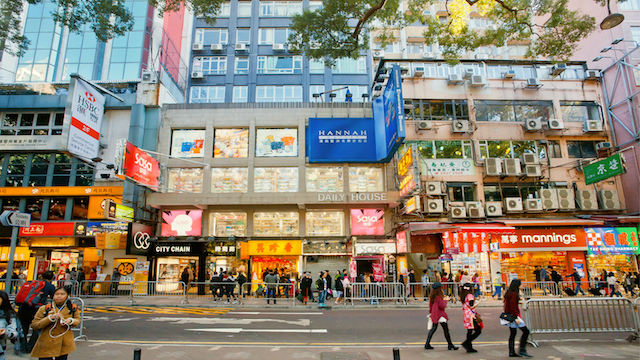 After falling 12 per cent in 2016, the pace of decline in Hong Kong high street retail rents should ease in the year ahead, predicts CBRE. Last year’s decline followed a 17 per cent fall in 2015. That represents a full 27 per cent fall since rents were at their peak in 2014. But this year, says CBRE Hong Kong in a research note, expect a fall of a more modest 5 per cent. In contrast, shopping centre rents were broadly flat in 2016. “In 2017, slower economic growth in China and depreciation of the Renminbi are set to undermine mainland tourist spending in Hong Kong,” said Joe Lin, executive director, advisory & transaction services – retail, with CBRE Hong Kong. “However, the fall in high street shop rents is not expected to exceed 5 per cent in 2017, and by the middle of the year, most leases that were signed during the market peak of 2014 will have expired, meaning that rents are expected to stabilise from then on. Leasing momentum is expected to gradually improve from 2016,” Lin concluded. In investment terms, CBRE predicts a 5 to 10 per cent decline in prices for street shops in core locations in 2017, coming off a 10.6 per cent decline last year.